A quick reminder that the Hot Topic exclusive POP! 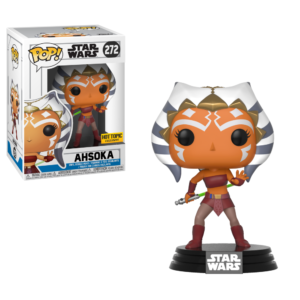 Clone Wars Ahsoka will be available tomorrow (8/15) in store and online. 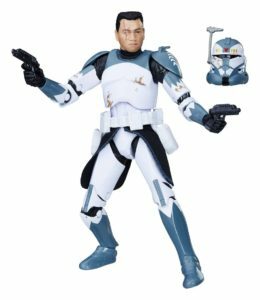 ShopDisney now has a listing for the shared 6” Black Series Clone Commander Wolffe. Priced at a competitive $19.95, it is currently on backorder and will be available on or around Sept. 3. That’s a nice sign for 6” Zuckuss if that retail partnership holds true. Thanks to Twitter follower @j5unD for the heads-up. update: Also Available on Barnes & Noble. For those in search of 6″ Clone Commander Wolffe and don’t want to shell out for GameStop’s $24.99 price point, check out your local Barnes & Noble as stores around the country are starting to stock them for $19.99. Thanks to Darth Rico for the image. 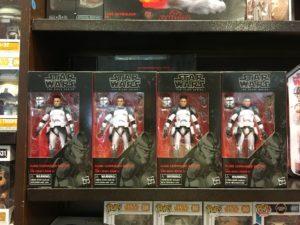 Our friend Dan over at StarWarsCollector.com received some intel regarding the shared exclusive 6″ Black Series Clone Commander Wolffe. Apparently it is now showing up in GameStop’s database (#168500) with a price of $24.99. Head on over for additional details. Twitter follower Shatterstar_03 send word that he found the Exclusive 6″ Black Series Clone Commander Wolffe at EBGames in Toronto Canada. These should start hitting GameStop, B&N and Disney Store relatively soon. Instagram follower maur00liveira send a report that his local GameStop in Manhattan, NY (34th & 6 Ave) has about 20 6″ Black Series Captain Rex figures. Good luck if you’re on the hunt. New Year’s Resolution: Reserve Rey and Rex! 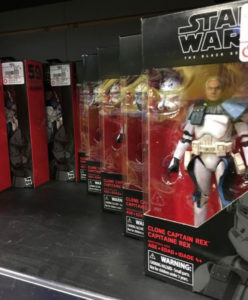 DorksideToys will soon be putting up individual preorders for the 6″ Black Series Clone Captain Rex and Rey (Island Journey) figures. Want the whole case? Preorders for wave 15 will be available as well so make reserving them your New Year’s Resolution at 12am ET! Check out their latest newsletter here for these deals and more. 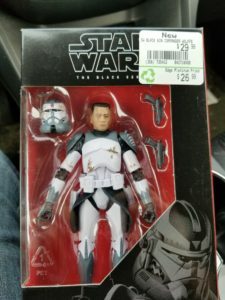 The newest case assortment of 6″ Black Series figures including DJ (Canto Bight), Rey (Island Journey), Captain Rex (new face tech) and the repacks of Captain Phasma, First Order Stormtrooper (TFA), Lando Calrissian and the Royal Guard have started to hit eBay. Look for preorders for these figures to open in a little over a week’s time. K & C Collectibles has added Topps Galactic Files Trading Cards, Clone Wars figure with vehicles, Roleplaying blasters, Attacktix game figures, Palm Talkers and Star Wars Transformers. Click the NEW PRODUCTS link under the Categories Section for a complete list of recently added items. 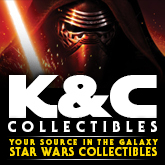 K & C Collectibles has added Black Series 6″, Star Wars Insider PX edition/Newsstand Covers, Kotobukiya, Limited Edition Bobble Heads, Electronic Figures, Battlefront Scout Trooper, AOTC 10″ Character figures, TIE Interceptor, and Epic Force Figures. Click the NEW PRODUCTS link under the Categories Section for a complete list of recently added items.